As one half of Vex’d, Jamie Teasdale (Kuedo) with his partner Roly Porter created some of the most aggressive sounds of the early 2000s, and their legacy has lived on in the changed dubstep scene they left in their wake. For any Vex’d fans, the most surprising thing about this album is its lightness; Teasdale stated that he was more of the ‘engineer’ in Vex’d rather than the ideas man, and if this is him stepping into the limelight it’s an incredibly welcome discovery. In Severant he has crafted not only something extraordinarily confident and beautiful, but one of the most unique electronic albums of the year. The majority of Severant focuses around the merging of two distinct flavours; vintage synths that hark back to Vangelis’ Blade Runnner soundtrack and ticking, rushing percussion that contrasts with it perfectly. The skilled drum programming is shown in his grids constantly, and throughout he marries it with the at times calming, at times paranoid, but always futuristic synths with an astonishing variety of ideas and directions. The synths recall an 80s vision of what the future might be; from Whisper Fate’s tranquil melodies to Ascension Phase’s loop that constantly threatens to come out a funky chord sequence by way of Truth Flood’s intensely threatening lines, similar sounds are reconstituted in vital and riveting ways. The percussion eschews the stomping bass of today’s club scene for keen, footwork-referencing beats that taper and clatter with endlessly exciting momentum, complimenting these synth-lines wonderfully. I don’t really want to pick apart the tracks, because most of these have to be heard and lived in to be fully appreciated. There are fantastic details to discover in every one of these compositions but it’s not necessarily the easiest first listen, and it took me a good few spins just to get my head around the overall sound. Once you do, though, Severant has so much to give. Although a great deal of these tracks are on the melancholic side of the emotive sphere, there is always a sense of warmth, nuance, and most of all freedom- three words which could hardly be less applicable to the back-catalogue of Vex’d. Although I’d recommend you just listen to the album about five times and you’ll just ‘get’ it, there are a few mind-blowing sequences. As an example, the breathless pacing of Onset (Escapism) leads into the rushing Scissors (a surprising and oblique rework of Carly Simon’s Why), which ricochets in alien directions with a power and confidence rarely heard on a debut solo album. What makes Severant work is that Teasdale’s voice is so strong throughout, he is constantly pitching his distinctive style in different directions across the LP and he’s unerringly successful in doing so. What’s most impressive is that the sound he’s hit upon is entirely and undisputably unique; there are touchstones but they are left far behind by the ambition of this release. For example the deep grooving wobbles of Salt Lake Cuts and the twinkling ethereality of Shutter Light Girl take electronic tropes, sure, but they are revitalised into distinct and beautiful pieces. 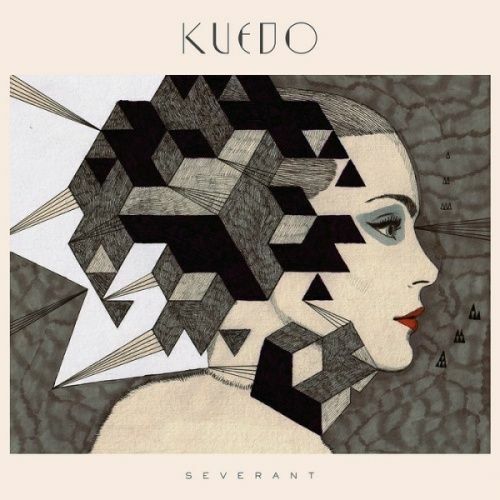 Kuedo never shirks away from taking his ideas in new directions either; Flight Path is a cold and propulsive number that is defiantly unsettling, whilst stunning closer Memory Rain is slow and pensive, leaving lost vocals to echo around the landscape. The rare use of vocals in this track and Scissors only go further in highlighting Kuedo’s remarkable skill in conjuring emotion and humanity purely by his tight compositions, an impressive feat in today’s sample-driven electronic scene. Expectations may have run high for the return of one half of Vex’d, but in Severant Teasdale more than exceeds these. When listened to as a whole (perhaps after a settling-in period), the album is unrelentingly stunning, throwing more new ideas and precise details into every song that the average beatsmith can conjure in an entire album. If you’re looking for something cutting edge; breathlessly exciting and endlessly distinctive, look no further than Severant. Great review, I wholeheartedly agree.